Years ago my dad was into horseracing. He loved to go to the track and bet on the ponies. He never spent too much. It was more about entertainment than making money. Although I think he made a few bucks most of the time. He had a system. He was especially good at reading the racing forms. He was able to uncover the often overlooked details that revealed information about a horse that might suggest it was underrated. I suppose it’s easy to pick a favorite. He especially loved to identify a horse that had strong potential to win a race that most others would underestimate. Nothing like picking a 5-1 or 7-1 and watch it blow by the favorites in the stretch. One day my dad and I were discussing his horse selection strategies and he revealed a little secret to me. He explained that horses have classes. Not like school…but more like social classes. He further explained that all things being equal, if two horses were racing and one came from better stock, the lesser horse wouldn’t or couldn’t beat the higher class. I think it’s like the alpha dog or pack leader thing. I’m not sure that is an entirely accurate metaphor, but I believe it illustrates the point. In only very rare instances would a lesser horse win given equal circumstances. 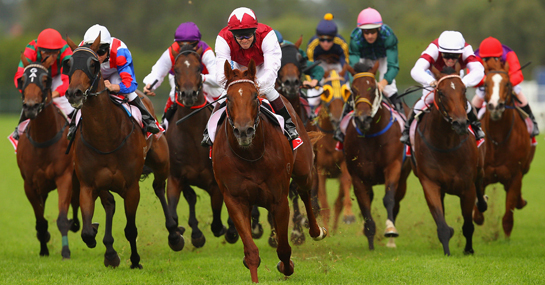 If a lesser horse was significantly faster or more suited for a specific race it would usually win. But it was rare. Personally, I found this an interesting phenomenon. In many ways, I have found this to be true about people. Especially about business leaders and the way they work. People will only operate at a level they feel they are comfortable or capable of performing at. Despite providing them all the tools necessary to be effective business owners, leaders or entrepreneurs, they will still do the work they BELIEVE they are capable of doing. The construction company owner sees himself as a construction guy – not a leader – so he gravitates towards doing the tactical work in a construction business. The realtor sees herself as an agent – not an entrepreneur – so she goes out and sells homes, rather than building a real estate business. The accountant, doctor, lawyer, appraiser, chef, beautician all see themselves in those roles – not the role of an business leader – and so they engage in their craft and neglect running the race at a higher level. Here is the most interesting point. They don’t even see it. They call themselves the business owner, entrepreneur, leader, but they don’t work at that level. Humans, until they become conscious of this phenomenon, will sabotage their own progress until they change one thing. The Way You Think About Yourself. We must reprogram our thoughts and beliefs and KNOW that we are effective, capable, deserving and successful business people. Who you believe you are will massively influence your performance. One of the first signs that you have belief issues – you will continue to avoid doing the work and activities of a leader. Despite having all the tools. You won’t work on your vision. You won’t set concrete goals. You won’t focus on the future of the business. You won’t define and cast vision and values. You won’t take the time to listen to and engage your people. As a result, your business simply will not advance. How can it without leadership? By the way, the same is true about effective management. Whether it’s you or someone else in your business managing. If you don’t see yourself effectively doing it; it won’t happen. It’s a steady and arduous process of mental management. The most effective and simplest approach it writing a reminder down. Perhaps something like – I am a highly effective business leader that is crystal clear on the direction and values for my organization and inspires and engages participants to support in achieving that vision. Commit to reading and focusing on this statement for 40 days. Nothing magical about that number. It just represents a time frame that requires some discipline, focus and consistency. Watch what happens, you won’t even realize it but soon you will be passing up the competition and running at a whole new level in your business. You will be the fastest odds on favorite to win the race.